One of the advantages of exercising at a gym or fitness center is the availability of professional strength training equipment. This equipment is built to last, offering high-quality frames, cables and upholstery designed to meet the needs of commercial facilities. Professional strength training equipment is often sturdier and more substantial than home equipment. In anticipation of hundreds of potential users, the welded steel frames and square bases ensure that the equipment won't wobble or move across the floor. While home equipment often has to consider the space-saving needs of its buyer, quality outranks size in a commercial setting. Is DP Exercise Equipment Still Available? Professional equipment often comes in a wider variety than home equipment. Commercial fitness manufacturers provide a number of lines of fitness equipment designed to meet the needs of the facility purchasing it. 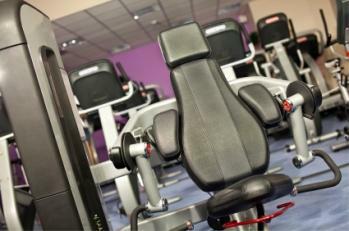 For instance, in a smaller gym, light commercial equipment designed for moderate-usage might be the best option. Alternately, a gym geared to power lifting might choose to purchase heavy-duty Olympic weights, squat racks and plate-loaded equipment. Certain facilities may choose to have their equipment personalized by the manufacturer. Fitness manufacturers allow purchasers to choose the color of the frames and upholstery, and in some cases, they even offer the option of emblazoning a logo onto the upholstery. Because professional equipment is built to last, most manufacturers of commercial fitness equipment provide long-term warranties covering parts and labor. This cuts down on the stress of the owner, who won't have to worry about the extra expense of equipment repair. Warranties vary by manufacturer, but limited warranties often last between three and five years. High-quality materials are a primary benefit of commercial strength training equipment. If you've ever used dumbbells or plate weights that have gotten a little rusty, you know that the rust can cause a mess and feel uncomfortable on your hands as you lift the weights. Commercial free weight equipment often offers stainless steel grips with polyurethane coated dumbbell heads and plate weights, preventing the rusting and black marks that often accompany plain metal weights or weights with rubber coatings. If you want a flexible workout, commercial equipment can provide you with that option. Not only do you have the opportunity to purchase a wide range of equipment, but many commercial manufacturers offer cable systems that can be adjusted to meet your workout's needs by changing the height or placement of the pulley system. The expense of professional equipment is a major drawback. While you may be able to purchase a full home fitness system for $2,000 or less, you can expect to spend from $1,000.00 to $3,000.00 on each piece of commercial strength equipment. Even a simple commercial weight bench can cost up to $800.00. If you want to equip a home gym with fitness equipment, keep in mind that professional equipment often takes up a lot more space than home equipment. If your space is limited, think carefully about your needs, and ask lots of questions about space requirements before purchasing commercial equipment. If you're opening your own gym or fitness facility, you must invest in commercial-quality equipment. Otherwise, look carefully at the benefits and the drawbacks of professional-quality equipment and make the determination based on your personal needs. In most cases, home-quality equipment will work sufficiently for your purposes.